I bought a whole kilo of fine ground polenta when I started making recipes from Bread Bakers Apprentice, however usually it is only needed for dusting the dough so even after this long I still have a huge bag of the stuff. For months every time I have seen a recipe with polenta I have made a mental note to try it, but until now I never had. Polenta is strange, it looks just like mashed potato but has a different texture and an extremely bland taste. 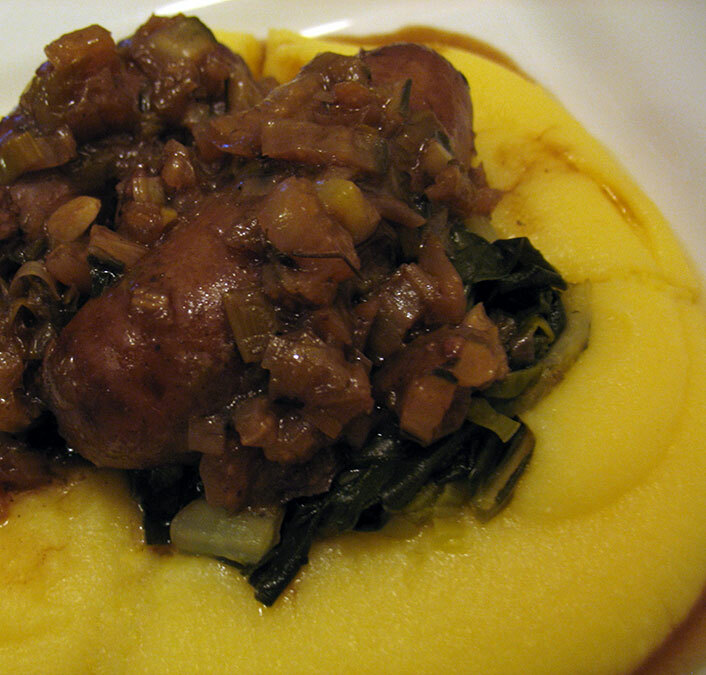 Thankfully the casserole had a lovely rich sauce of red wine and beef stock which carried the bland polenta. I like polenta, but I don’t see it ousting my regular accompaniments of rice or potatoes, but it is great for a bit of variety. 1 onion, sliced. I actually used 1 leak instead as I had run out of onions. 300 grams of chard, separate the stalks from the leaves. Slice the stalks finely, and the leaves coarsely. Grill the sausages on a high heat until browned, they don’t need to be cooked through. Drain the excess fat from the sausages and add to a pan or cast iron casserole dish. Add the onion (or leak) and chard stalks to the casserole, under a medium heat. Keep the contents of the pan moving so they do not burn. After the vegetables are starting to soften, add the beef stock, red wine, garlic and thyme. Leave to simmer for at least 30 minutes, or longer if necessary. In the meantime cook the polenta in one pan, and the chard leaves with around 1/2 cup of water in another pan with the lid on. Once all the parts of your meal are ready it is time to plate. I noticed that if you heap the polenta on the plate it tends to flatten out when you place things on top of it. 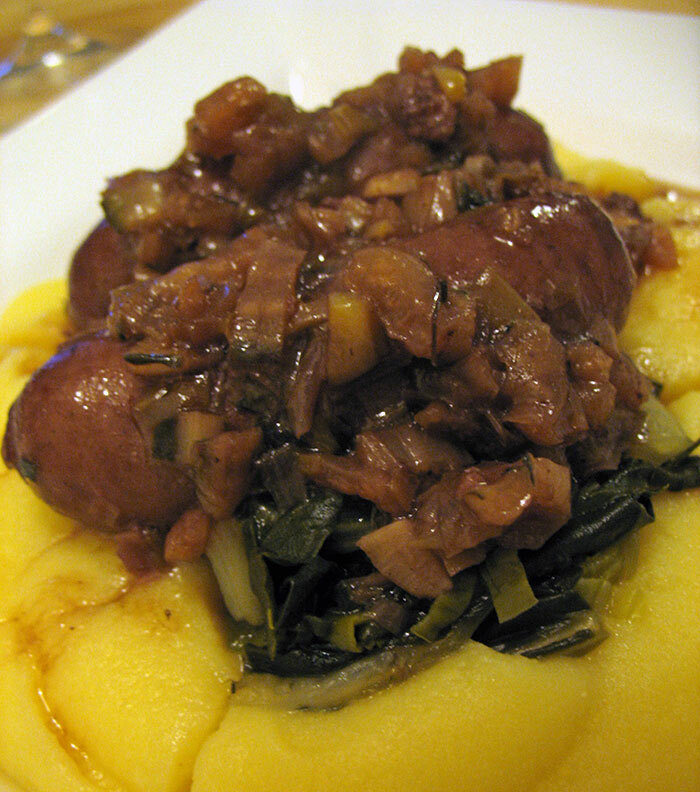 To get around this create a doughnut shape of polenta, then add your chard leaves into the space, finally topping it all the sausages and the rich sauce.